1 - We will design custom plug-in boards for CableEye to meet your exact test requirements. If you prefer, we can also provide you with the routing and layout information to create the design in-house. In these photo, you see one of a series of ten custom CB boards we designed for one of our customers. Contact us for a quotation on any custom interface development that you need. 2 - We designed the CB30B daughter board shown here to mount on the CB30 board to interface the Cannon DL-156 ZIF (zero insertion force) connectors. 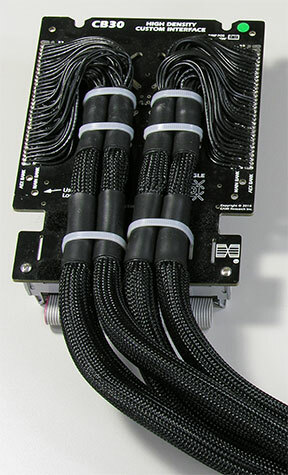 This 384-point CableEye system provides three 64-pin banks for each connector. 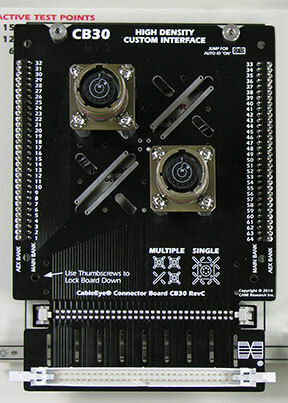 The CB30 board can also be configured for Cannon DL-96 and DL-60 connectors. 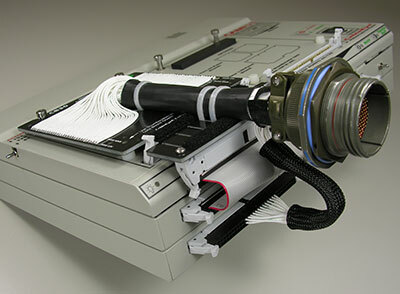 The connector graphic for the DL-156 appears below. 3 - We used this CB30 board to secure the adapter cable for a 128-pin high-density circular connector. 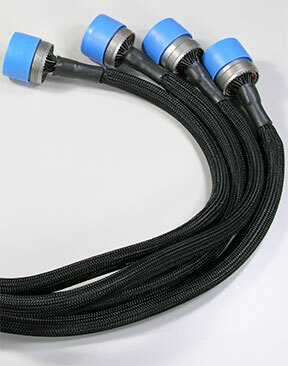 Nylon lacing and wire-ties are used to route and secure the wiring leading to the terminal pads. 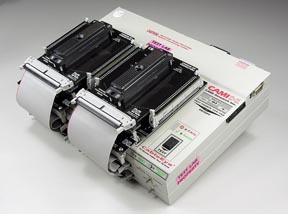 The CB30 operates up to a maximum of 800vDC or 500vAC. For higher voltages, we would replace the CB30 with two 64-pin AMPMODU connectors to make a discrete-wire interface good to 1500vDC or 1000vAC. 4 - We mounted two independent circular connectors on this CB30. Because the customer wanted both connectors on the same board and more than 64 test points were required to do this, we used a CB30 (128-points maximum) instead of a CB8 (64-points maximum). The board is wired from the back, and if you look carefully, you can see some of the wiring through the unused slots. 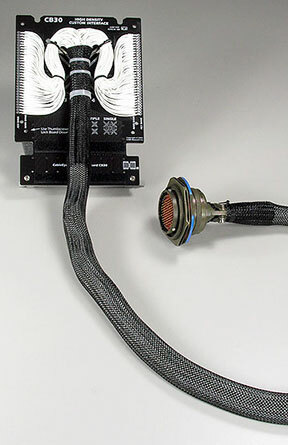 The upward-facing connector in the front takes a 64-conductor flat cable that connects to an expansion module to obtain the additional test points needed. 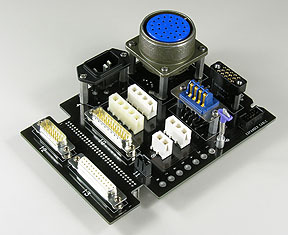 5 - In this application, four adapter cables connect to a single CB30 board. The upward-facing connector seen in the previous image is mounted on this CB30 in a downward direction on the back of the board to make room for the adapter cables. Padding is added to the front edge of the board to prevent chafing as the adapter cables are moved around. 5 - This unusual connector required more than 128 test points, so we used all 128 point from a CB30, and added a single 64-pin AmpModu connector to pick up the remaining points and route them to an available bank on the tester.